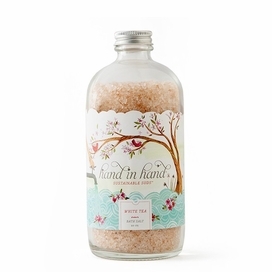 Hand in Hand is an eco-friendly beauty brand that ties charitable donations to everyday, household products. With the help of their partner, My Neighbors Children, they are able to give soap and clean water to impoverished communities around the world. For every bar of soap purchased, Hand in Hand gives away one bar of soap and a month of clean water to children in need. Not only are they celebrated for their social mission and giving back, but also for their efforts in sustaining the environment. Realizing how important their environmental responsibility is, all Hand in Hand's Sustainable Suds products are as natural and fair-trade as possible—every ingredient is not only natural but is harvested and grown in an eco- friendly way for your body's enjoyment. Understanding how important sustainability is when it comes to both the environment and giving back, Hand in Hand provides more than just your average soap.